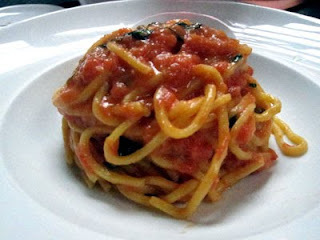 We've decided to make this week's posts food centered. Why? Well, we'd hardly call ourselves gluttons but we're certainly not afraid to admit how much we love to eat! And, when planning a party or event the hardest thing trying to figure out what you'll be feeding your guests. If you have bad decor that is one thing people can forget, but have bad food (or music!!) and your guests will be talking about it for years to come, and not in a good way. Recently we've been to a bunch of weddings and we both agree on one thing - one of the best things about a wedding (in addition to seeing two people celebrate starting their lives together, blah blah blah) is the cocktail hour! The cocktail hour tends to feature some of the best food of the night, and is a great way for couples to experiment and really treat their guests to a delicious smorgasbord. 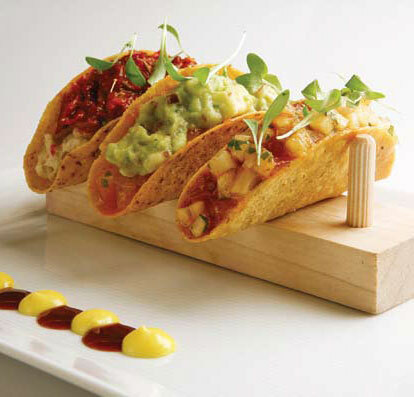 The trick to a great cocktail hour is tasty food that requires minimal silverware, can be eaten while standing up, and won't spill all over you. And, as always, this applies to any event or party, not just weddings. Think birthdays, anniversary parties, New Year's Eve, casual dinner parties - the opportunities to showcase these fun foods are endless! 1. French Fry Bar: While french fries don't instinctively seem to be wedding appropriate, they are delicious, easy to serve, and a big hit among guests. They can be served in a number of different ways, such as the traditional funnel (pictured above), in little shot glasses, in small baskets, or just buffet style. And don't forget to throw in a number of different dipping sauces a la Pommes Frites. 2. Chinese Food Take-Out: We were recently at a wedding where one of the appetizers was Chinese food served in take-out boxes! 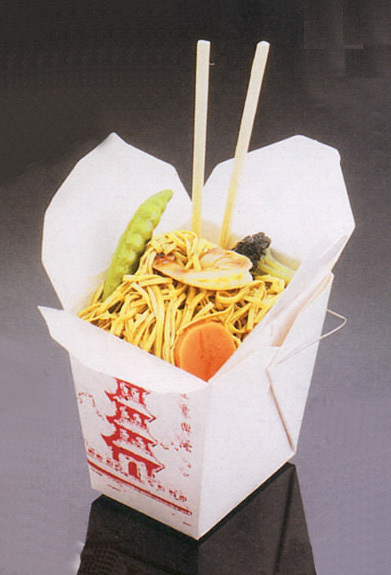 It was ingenious: chefs prepared either noodles or rice with stir fry veggies, shrimp or beef, dumped them in a takeout container, and voilà! Pure deliciousness AND it's easy eating for the guests -- just grab a set of chop sticks and you're free to mingle. 3. Pasta Bar: If lo mein isn't your type of noodle, how about some penne? A delicious wedding trend is setting up a pasta station, where guests can choose their type of noodle, sauce, and cheese for a delicious pre-wedding treat! While we do foresee potential red sauce disasters, our motto is no stain, no gain. We love this idea because not only are there so many options to choose from, but it's a good idea for guests to start carb-ing up before they hit the open bar! 4. Sushi: Serving sushi for 200+ people can be very expensive, but we just LOVE it so we had to add it to our list. Which means if you happen to have a sushi at your event, pretty please invite us! 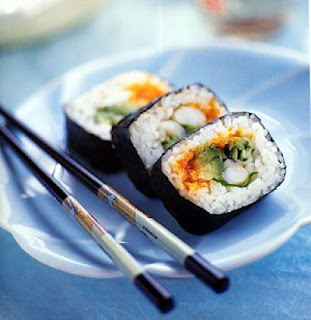 There's a variety of different types of sushi to choose from, so have fun with it! Just remember to throw in some veggie options for your vegetarian guests, as well as guests who are more hesitant to give raw fish a try! If you can't afford to supply a whole bar, selecting one or two rolls to have passed would be a great alternative. 5. 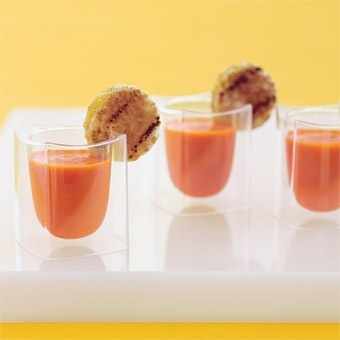 Soup in Shot Glasses: One idea that we both love, especially for fall and winter weddings, is soup served in shot glasses or espresso cups. Think how nice it would be to have a warm sip of butternut squash soup on a chilly evening. But to take it a step even further, you can serve small portions of tomato soup with little grilled cheese bites! We think this is very cute and creative, plus very kid friendly! 6. 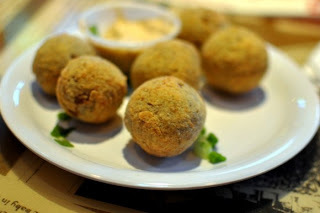 Fried Macaroni Balls: Another kid friendly option is to serve mini fried macaroni balls! Words cannot describe how yummy they are, plus they are perfect finger food. 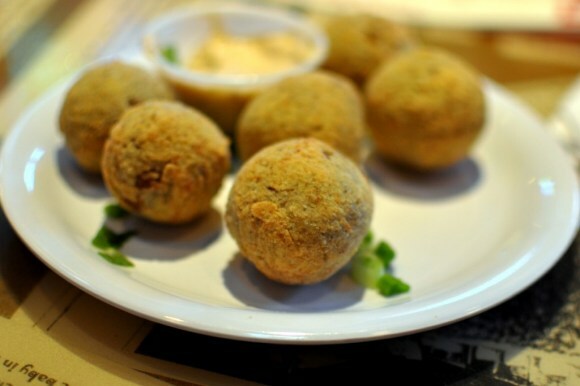 We love old fashioned macaroni and cheese, but if you want to go a little fancier, you can opt for fried risotto balls, which are equally delicious and just a tad bit more classy. 7. Pretty much anything miniature: Hamburgers, milkshakes, tacos, cheese steaks, crab cakes - seriously anything that can be made into a small finger sized version is sure to be a big hit with your guests. People love these fattening and delicious staples for meals, but of course no one would eat something large and messy during cocktail hour. Make it mini and you're good to go. Guests will love the fact that it is tiny and neat plus they'll think your awesome for including these "comfort" kinds of foods. Ugh. I can't even tell you how many nights I've spent crammed into a tiny booth or waiting in line at Pomme Frites. Their rosemary garlic mayo is to die for. Oh, and the Parmesan Peppercorn. I'm salivating right now. I would love to see Belgian fries in a formal setting. Haha, we love it! Pesto Mayo all the way. 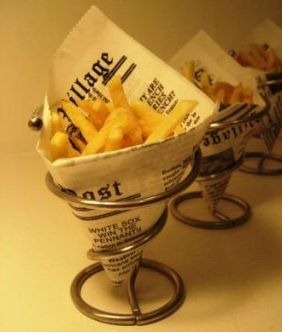 Jen had a french fry bar at her wedding and they were such a hit! Goog looks great - very crisp photos! I love minature hamburgers and crabcakes!